Michael Joseph Brown is Academic Dean, Interim President, and Professor of New Testament and Christian Origins at Payne Theological Seminary. He received a Bachelor of Arts degree from Vanderbilt University, as well as a Master of Divinity degree and Doctor of Philosophy degree from University of Chicago. Brown has authored a number of books, including, Blackening of the Bible: The Aims of African American Biblical Scholarship, The Lord’s Prayer through North African Eyes: A Window into Early Christianity, and What They Don’t Tell You: A Survivor’s Guide to Biblical Studies. 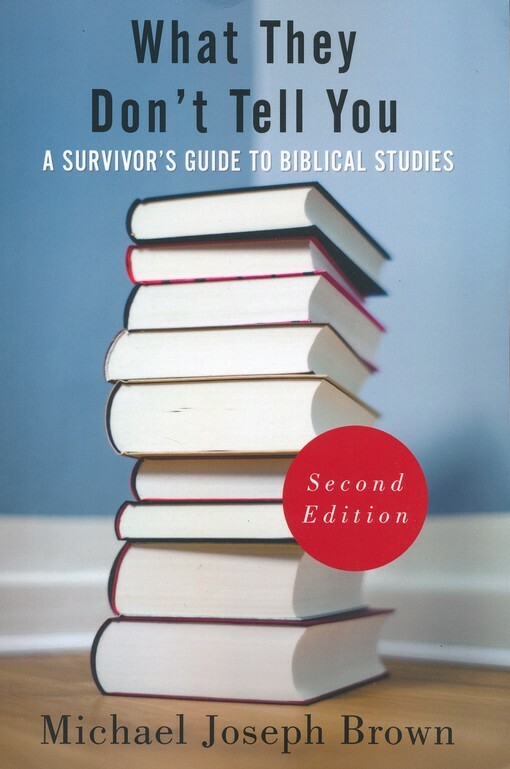 Originally published in August 2000, What They Don’t Tell You has sought from the beginning to equip and prepare incoming students with a general survey and exposure to the underbelly of biblical studies. Now, 15 years later, an up-to-date second edition has entered into the marketplace with a fine-tuned appearance and revised content. Brown rightly acknowledges that the milieu of biblical scholarship has shifted slightly since the original publication of the book, and sought to address accordingly. Consequently, Brown has added additional “rules of thumb” and an appendix that the reader is sure to find helpful. What They Don’t Tell You remains organized in a logical manner to best cultivate the needs to the student or interested reader. The book opens with a brief introduction to the world of biblical studies, juxtaposing the aims of devotional bible study with that of an academic study of the bible. Here Brown offers an excellent survey of the history of biblical scholarship, as well as an overview of the various methods of biblical interpretation. The remainder of the book presents 29 “rules of thumb” that are thematically ordered around: (1) reading and interpreting the Bible, (2) understanding biblical scholarship, and (3) surviving the newfound understanding presented by Brown. The list of “rules” comprising this book, according to Brown, are “not [meant to be taken as] exhaustive, nor are they meant to be taken as hard-and-fast rules that can never be broken” (xii). This explains Brown’s choice to label them “rules of thumb” rather than merely “rules.” But, this also displays a potential shortcoming of the book as a rule of thumb is somewhat subject and largely variegated in nature depending on who you ask. In other words, the book should be understood as more of a list of Brown’s personal rules of thumb when approaching the topics, rather than a list of concrete list for biblical studies in general. Still, I think Brown has brought together a thorough list of important considerations when approaching the subject of biblical studies. His effort is surely not aimless. What They Don’t Tell You is a wonderful primer to the world of biblical studies. Brown has provided an engaging and timely revision to a well-received book. Be prepared for occasional disagreement with Brown’s “rules of thumb,” but don’t be too quick to through the baby out with the bathwater. If you are interested in entering the arena of biblical studies, Brown will certainly get your feet wet with the right kind of water. It comes recommended from this reader.